Maybe if I send him my Bat iPod brass knuckles he could whip me up a real-life set? I can dream. 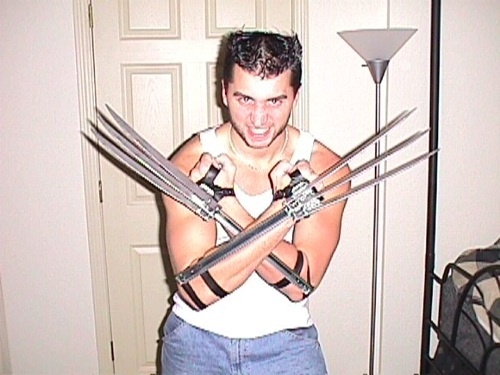 Or maybe I should send them to the guy who made the actual set of claws used in the X-Men movie. This article shows how Canadian special effects artist James Gawley crafted the iconic weapons, and the difficulties of translating comic book physics into everyday life. Well worth a weekend read. what was more difficult…the claws, or the hair? What a coincidence! Last night I created a character, The Manx Cat, equipped with a set of those claws. (What cat doesn’t have claws?) Great Minds Think Alike! I dunno what’s more disturbing–the claws or the grin on his face. He looks like he’s enjoying this just a little too much. Well worth a weekend read indeed! I have completed the geek cycle for one week in the best way I’ve found yet. Hey, if I had claws like that, I’d be grinning too! Hey Nate! If you’re reading this I want to tell you that you’re real expert. This Claws you made can be used as the real weapons you can sell it anywhere with the reasonable prise of course. Any Weaponeer, Every Collectioner would happily buy those thing from you just sharpen those blades. I would like to use them. Image walking in the streets at night and one of those assh*les coming on with with knife. Yuo just show your claws and they are afraid of you. My advice To you: Sharpen them and Sell them.